Identification: This Eubranchus has a translucent body sprinkled with opalescent white flecks. The smooth cerata are spindle-shaped with opaque-white tips. The opaque pigment is broken by irregular, longitudinal clear lines. The rhinophores have translucent-orange bases and white apexes. The cephalic tentacles are tipped in white. It can be distinguished from Eubranchus sp. # 2 by the clear axial streaks on its cerata, the lack of brown spots on its notum and the lack of basal white bands on its rhinophores. 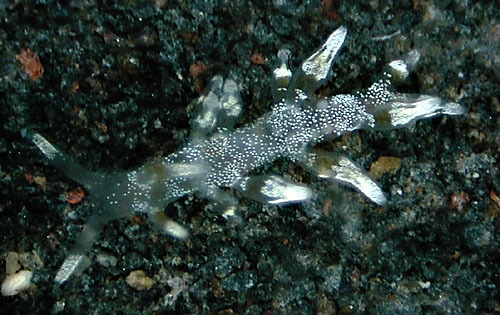 Natural history: Eubranchus sp. #5 is a rare species known from five animals found in exposed, rocky locations at depths of 1.5-3 m (5-10 ft) and in Halimeda kanaloana beds at depths of at least 8 m (25 ft). A 2.5 mm animal laid an irregular, oval egg mass. Taxonomic notes: It was first recorded in Hawaii from off Makena, Maui by PF on Jan. 6, 1992. Photo: CP: 2.5 mm: Maalaea Bay, Maui; Nov. 30, 1997.